This nice little sign was above the front seat of a train I was travelling on in Thailand while researching my latest blockbuster of a book, which is due out soon, in fact I’ll be able to tell you when as soon as my agent and publisher sober up, they’ve been celebrating ever since they read it – apparently I am going to be as big as J. K. Rowling but they didn’t specify which bit of J. K. Rowling I was going to be as big as if you see what I mean! I think it is quite nice that you can save a Monk’s legs don’t you? Although I thought that Monks were supposed to be able to endure long periods of discomfort like err… standing and stuff, but I suppose I have watched too many Shaolin type movies, or maybe the Monks in Thailand are just not very strong. 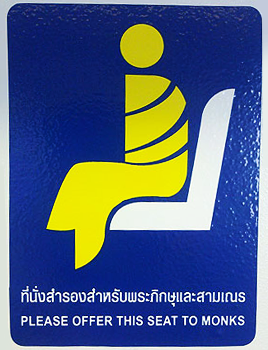 There was one other thing that struck me about the sign – how many Monks are you supposed to offer the seat to? I asked around and no one seemed to know, but then as I was speaking English and they were speaking Thai which believe it or not doubles as a cuisine I don’t think they understood me. You know Thai must be a very complicated language if you can use it as a cuisine too – just a thought! Actually I have to say that the record of my trip through Thailand and indeed one or two other countries won’t be recorded in my forthcoming and soon to be blockbusting Travelogue because the ‘authorities’ there read the chapter devoted to Thailand and very graciously supplied an awful lot of cash to ‘persuade’ me to not include the chapter in my Travelogue. Of course this clever cat isn’t dumb and Thailand together with the other countries are obligated to keep up the exorbitant (their choice of words not mine) monthly charges or I will publish a second and more complete edition of this explosive (in every way) book. Its not really a Travelogue Too Far but it is “wicked” as my agent who seems to act as though she is 12 most of the time said. I Know That It Is Nowhere Near Christmas – BUT! I don’t want to worry any of my readers, except the ones who haven’t bought my book yet but there is, I have heard, been a bit of a run on stocks of my wonderful book “Getting Out – Excerpts from a Cat’s Diary” recently and I have been told by my rather panicky and excitable publisher that there is a possibility that supplies of my wonderful and eminently readable book might be in short supply this Christmas – a little like a Disney Buzz Lightyear toy and all of the other must have toys of the past. With this in mind my advice to anyone wanting to buy my book for themselves or as a wonderful gift for a loved one is to get at least one copy now – just think if you buy two or more you’ll probably be able to sell the others at a massive profit like the person at at Amazon.com who is currently charging double for his or her copy and they have probably read it – I call that a ‘result’ don’t you? 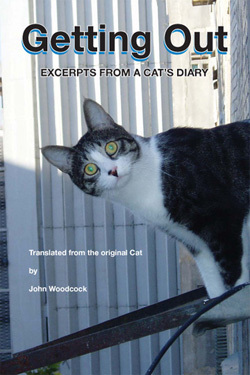 If they have run out at Amazon.com don’t forget you can always get a copy of my perfect book from my www.thecatsdiary.com.